Dir: From Highway 85, WEST ON PJ ADAMS PKY., SOUTH ON EGAN DRIVE. Cute brick home on a very large lot. Perfect for a first time home buyer. This home is on a dead end street. Nice neighborhood. Home in a cul-sac. This home is very cute and needs a loving family to enjoy the quite area. It is a 3 bedroom home and has an open living room, dining room area. Take a look today. Look at all the home you get for the money. Wow. Buyer to verify and satisfy themselves of all information that is important to them. Subdiv: OAKDALE MINI FARMS RESUB BLK 17 ImmOcc? Dynamite Home with a lot to offer a first time buyer or anyone who needs a nice home. This little delight features a great room and an eat in kitchen with a breakfast bar that overlooks the great room to keep the cook involved and to keep an eye on the kids. Outside you guys will love the workshop with electricity, a pool with deck surrounds and the yard is already fenced. This is Walker Elementary School district,another one of our “A” rated schools. Please note this is a Short Sale and we will need additional time for offer acceptance. Home is in a very convenient location with easy access to where ever you may need to go. This home is on a flat lot. Property to be sold in “as is” condition, power and water are not on, buyer to provide if inspection to be done. 10 Acres of your own private getaway! From the entrance by the road, down a winding tree-lined driveway…enjoy the wrap around drive for easy entrance and exit. Close to town yet secluded; surrounded only by 10 acre lots, in this subdivision you have plenty of privacy, yet this 10 acres sits less than 5 minutes from the I-10 285 exit. This piece of real estate is perfect for the family that loves the outdoors. Relax and feel the country on your front deck, or come inside and enjoy the cozy fireplace. This home has recent updates including new dishwasher, new stove, and a 2-year old well. New vinyl skirting, new vinyl siding and new vinyl flooring; new carpet as well high-speed DSL availability. Come by and take a look today! Watch the Virtual Tour now available. Listing Broker/Salesperson has ownership interest in the property. PROPERTY TO BE SOLD “AS IS”. Dir: I-85 South to left on John King Road. Then Left On Oak Terrace around the back side on the right of the street in the back curve. South of I-10. This home is located in a very cute and nice neighborhood. The home is sitting in a corner of the curve lot which makes it bigger. It has a very level yard. The yard is Chain Link and even has a nice dog pen fenced off. It has a 12×16 nice yard building. This home has new paint and new carpet just put in. The home is Very Nice. It has a TWO car garage. Catheral ceiling in living room and a box ceiling in the master bedroom. It is 3 bedroom and 2 baths. This is a must see and will not last long at this price. It has brick on the front part way up then vinyl. CUTE. Refrig works but / The ice maker does not work she does not think. This home is a must see and ready to move in now. It is in very nice condition with all the new paint and carpet. Buyer to verify any information that is important to them. Please do not let this large lot and 2 car garage get away from you. Price just reduced for quick sale. Just put in Carpet and paint 10/8/08 and cleaned house and yard. Subdiv: OAKCREST F & G PLAT 4 ImmOcc? Dir: Hwy 85 north then right onto Auburn Rd. Take a right onto Old Hickory Rd. Home is on the right. Charming home on over one acre. This home has been well maintained and upgrades have been made, including double pane windows, crown molding, newer paint and carpet, and more. The living room features beautiful hardwood floors. Another great feature of this home is a separate family room off of the kitchen that opens to a large screened-in back porch; a perfect place to unwind at the end of the day. The backyard is fully fenced and has a yard building. If you are looking for a home away from the hustle and bustle yet close to town, make sure you take a look at this property. Square footage and acreage taken from property appraiser’s site. Measurements are approximate. This is a short sale. Buyer to verify and satisfy self regarding all information contained herein. Dir: Highway 85S to Left on John King Road. Go almost to the end of John King. Right into Kings Crossing S/D. Take a left on Kensington Ln. Hous on the left. South of I-10. SELLER SAYS MAKE OFFER NOW. Very very large Level Lot with a storage building. Wow what a nice Home. Ready to Move in. Spend your afternoons rocking on the front porch or relaxing in the big backyard in a swing. There is also plenty of room for a pool. Backyard has a privacy fence on two sides and fenced in the back with wire fence. Lot behind is trees so you have lots of privacy. This is a very nice neighborhood. Spend your winter nights curled up by the fireplace and Summers enjoying the wonderful backyard. Open floor plan. Cathedral ceiling in living room. This home has just been redone ceiling and walls in the Living room, dining room and breakfast room. New 17″ tile has been put in the kitchen and dining room. Check out this wonderful home today. Buyer to verify all information that is important to them. Put this home on your list to see today. This home shows beautifully. This is a short sale. Please put in your offer today. Subdiv: STONEBRIDGE PH 2 ImmOcc? Dir: From Hwy 85, turn east on John King, go approximately 1.5 mi to left on Primrose, left on Palmetta and follow into Stonebridge to the end; Turn right on Penney Ln, 3rd house on left. Here’s your doll house, tucked away in a quiet subdivision south of I-10. Real wood floors in entry and kitchen/dining area, durable berber carpet has been well cared for and all cabinets have been modified with custom drawer slides for convenient access to everything. Corner gas fireplace keeps you cozy in the winter, new a/c unit was installed in ’03, new roof in ’05. Enjoy the park-like setting of your back yard with mature trees and chain link fencing all around. The utility shed, greenhouse and patio furniture including barbeque grill are included. Fence features one drive-in gate and 3 walk-thru gates. Single car garage is equipped with lots of cabinets and window air conditioner for the handyman’s comfort. Take a look at this one, it’s perfect! Dir: Hwy 90 E to a left on Dorcas Hwy/Hwy 393. Immediate left onto Harielson Rd. Home is on the right. This 4 bedroom/2 bath home was built in 1989 and sits on a half acre of land. There is attractive cedar planking accenting a wall in the family room. New laminate wood flooring is in the kitchen and halls. The den/office area has built-in cabinetry for maximum storage possibilities. The laundry area is located inside for your convenience. All buildings have recently had a metal roofs installed. If you like to entertain family and friends- there is an additional building complete with a sound stage, hand-carved wet bar, and gathering porch. There is a small, fenced, above-ground pool for entertaining the grand-kids! A separate apartment or “mother-in-law’s quarters” offers privacy to visiting family or potential income. Consists of den, kitchen, bedroom, and bath- and currently rents for $550/month. The storm cellar with rebar reinforced concrete block creates a solid shelter area. Can be powered by electricity or generator. Features include a/c, multiple bunk beds, storage shelving and toilet facilities. The yard is fenced for added privacy. Plenty of covered lean-tos for outdoor storage. Out back, there is a handy fish-cleaning station and protected gardening areas. Call today to see all this great property has to offer! Custom All Brick in this quiet community the home sits on a corner lot. Hardwood floors in the kitchen, breakfast room, dining room and hall ways. Sky lites in both baths. Masterbath has double vanities with walk in closet, whirlpool with custom window, & seperate shower. This 3 bedroom, 2 bath has a split floor plan. Large living room with cathedral ceiling and beautiful wood burning fire place with custom angled mirror that accents the mantel. This home has beautiful landscaping, a privacy fenced back yard with a 12×24 work shop with electricity. New roof and sky lites in 2006, as well as new microwave and stove,New countertops just installed Jan.2009 Come see this home today. Seller pays closing cost with acceptable offer. Dir: 85 N. Right on Redstone (first Rt. past Hospital). Right at stop sign onto Brookmeade. Left onto Covell. Right into Steeplechase subdivision. Left onto Affirmed Ct. House is fourth on right side. Well maintained 3 Bedroom, 2 Bath Florida home in one of the nicest neighborhoods in Crestview. Excellent location near shopping, schools and hospital. The den/office can easily be converted into a 4th Bedroom. Home has formal dining area which boasts columns and arches to give it that extra flair. Large living room with planter ledges to add to the affect. Living room with nice trim mantel around the fireplace. Kitchen is open with bar and affords a breakfast area/nook with views of the large back yard. Living, dining and kitchen is tiled throughout. Laundry room is off of double size garage. This is a spit bedroom floor plan. Enclosed patio has ample room with ceiling fan. Backyard is roomy and is totally fenced in. The porch has been totally enclosed and is extra roomy and offers additional room. New Middle School and Elementary school will be open 2009-2010 school year which is located in close proximity to the subdivision. Home warranty being offered to buyer, a $395 value!! Dir: FROM 85 NORTH RIGHT ONTO REDSTONE, RIGHT ON BROOKEMEADE (AT STOP SIGN). LEFT ONTO COVELL INTO STEEPLECHASE SUBDIVISION. RIGHT ONTO STEEPLECHASE. LEFT ON RISEN STAR, ALL THE WAY BACK TO NORTHERN DANCER. PROPERTY FIRST HOUSE ON LEFT (CORNER OF NORTHERN DANCER AND RIVA RIDGE). OPEN HOUSE SUNDAY 2 to 4 PM, Come on out to see this home.A truly charming area South of Crestview, it’s a sub-division within Adara Golf and Country Club. All brick home has just been freshly painted with neutral colors (beige bisque)throughout along with brand new Jonquill carpet. Home boasts a formal dining room with wainscoting and chair rail plus an eat-in kitchen with an island that can be moved, cathedraled ceilings, and hard surface counter tops, super-size pantry, plant shelf and Oak panel cabinetry and more. There are 3 bedrooms plus a study or 4 bedrooms whichever you prefer. The Great room features cathedral ceilings, plant shelving and a tiled fireplace, a sliding glass door to the back yard. Master bath has double marble vanity, a deep soaking tub and a separate shower and a walk in closet. This is a cul de sac location and this home offers so much and its in excellent condition. This is a SHORT SALE. PROPERTY TO BE SOLD “AS IS”. Dir: From I-10 Crestview exit take Hwy 85 south to left onto John King Rd to 346 on left side of John King. Dir: FROM HWY 85 N. TURN EAST ONTO AUBURN RD. TAKE FIRST RIGHT, OLD HICKORY. GO TO THE END OF OLD HICKORY. TURN LEFT ONTO GIBBS, NO STREET SIGN AT GIBBS. SECOND HOUSE ON THE RIGHT. Custom 3BR 2.5BA home situated on over 2 acres, with another 5 acre adjoining lot available for purchase. Secluded country setting only minutes from shopping and schools. Home offers a split bedroom floor plan and 9ft ceilings. Livingroom has a 10ft ceiling, fireplace, wood laminate flooring and french doors opening to the back porch. Kitchen has top of the line stainless steel appliances, ganite countertops, walkin pantry, undercounter lighting and breakfast bar. Master bedroom has a trayed ceiling and huge 6×13 closet. Masterbath has a whirlpool tub with heater, separate shower and double vanity. Other features include, upgaded lighting, sprinker system, Formal diningroom, study/ office, storage shed, beautiful landscaping and fenced backyard. Listing agent is related to seller. Washer and dryer do not convey. Listing Broker/Licensee related to owner. Dir: 85 North to right on Airport Road. Brooke Estates in 1 mile on the left. Enter and take first left then next right and home is on the right. Large home with swimming pool and tennis available to you. This floor plan has tons of space for the family. Two living areas, one which is open to the large kitchen and dining area. If you need privacy for your guest this split floor plan provides a guest room and full bath away from all other bedrooms. Master bedroom is large and the master bedroom has a gorgeous master bath with tons of linen storage. Dining room can accommodate large furniture. Three sliding doors to the covered patio. One from each living area and one sliding door from the master suite. Home has surround sound, security system, transferable termite bond, sprinkler system, upgraded A/c and heat pump available if desired, newly painted, newly landscaped and a huge level back yard completely fenced in. This home is a must see. Buyer to verify schools, HOA fees, measurements and any other details of importance as they are subject to change. What a find beautiful all-brick lakefront home on approximately 2.9 acres. Don’t miss this rare chance to own lakefront acres — Enjoy the view from the Florida Room or step out on to the covered back porch. This home has been well-maintained; Property also has a mobile home close to the street for guests or rental.Be sure to take a look ! Listing Broker/Salesperson has ownership interest in the property. Dir: FROM HWY 85 SOUTH. TURN EAST ONTO APLIN RD. TURN LEFT ONTO ATWELL RD. RIGHT ONTO CHESTNUT. RIGHT ONTO DIPOLO. THE PROPERTY IS AT THE END OF DIPOLO. Beautiful custom built home surrounded by mature trees and natural landscaping. 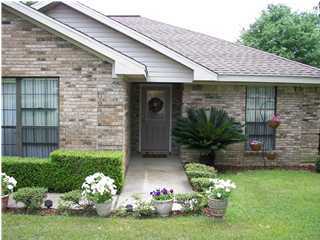 A quiet and private neighborhood located close to downtown Crestview. Entering the home through the front door which was special made for the house, you will come to a Spacious Great Room featuring a vaulted ceiling and gas fireplace. Also in the Great Room is a NEW 61 INCH SAMSUNG D.L.P/H.D. FLAT SCREEN T.V. with surround sound and 7 Polk Audio speakers installed that will convey with purchase of the home. A magnificent Kitchen has granite countertops, center island, pantry, 15 inch deep cherry cabinets, under cabinet lighting, stainless steele appliances, gas cook top and a Bosch dishwasher. Master Bedroom has a double treyed ceiling. Master Bath has a large 3.6ftx6ft walkin shower and a double vanity with lighting underneath. Bath #2 features a whirlpool tub with shower. Quest bath features a walkin shower and is located in the quest bedroom. Flooring consist of gorgeous laminate and 18 inch tile (no carpet). The screened porch has a brick floor and ceiling fan. This home has foam insulation and a Geothermal heat and air system, the owners average electric bill is about $80.00 a month. Other features include, a Basic 1year warranty, metal roof, faux wood blinds, 12x12ft wood deck, 25×35 metal building, A.D.T. security system and oversized garage. Washer and dryer do not convey. Dir: 85 S then left onto Live Oak Church Rd. Take a right into Adara. Take a left onto Timberline then a left onto Skyline. House is on the left. Subdiv: HUDSON ADDN TO CRESTVIEW ImmOcc? Dir: From Highway 90 west, turn left onto Hundson Street. INVESTMENT OPPORTUNITY. THIS PROPERTY OFFERS A 2 BEDROOM/1 BATH HOME THAT IS PRESENTLY BEING RENTED. THIS IS ONE OF FOUR PROPERTIES, OWNER WOULD SEE ALSO 398 E. FIELD AVE, 628/630 E. WALNUT AVE ALL IN CRESTVIEW CITY LIMITS. BUYER TO VERIFY ALL PERTINENT INFORMATION OF LISTING. Dir: Highway 85 North to right on Airport Road. Continue to left on Buckhorn Drive and turn left. First house on the left. BACK ON MARKET. SHORT SALE FELL THROUGH. All brick home situated on 1 acre lot conveniently located to schools, shopping, library, and post office. Surrounded by beautiful trees, this home provides privacy and is located on a quite cul-de-sac street with limited traffic. Also, there is a detached garage that can be used as a workshop with an additional two story storage building located next to the garage to provide ample storage. Inside you will find 3 bedrooms, 1.5 baths, kitchen with breakfast bar, dining area open to the family room with wood-burning stove and fenced backyard. Come by and take a look and make this one yours today!! Dir: Travel south on Hwy 85 just past PJ Adams and take a right onto Southview Dr. Take a left onto Ray Ave. Home is on the right. South of I-10. Great location and convenient to bases. Updated recently. New roof installed in December 2008. Recently painted throughout. This great home features vaulted ceilings in the living room and master bedroom, a beautiful fireplace, laminate wood flooring in most areas and ceramic tile in the wet areas. New carpet has been installed in two of the bedrooms. 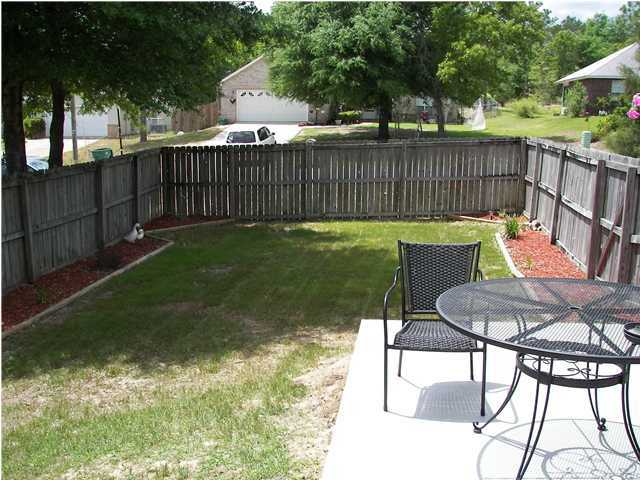 The spacious backyard has a privacy fence, yard building and lovely, mature trees. This home is ready for new owners and won’t last long. Please call for a showing today. All measurements are approximate. Square footage taken from property appraiser’s site. Buyer to verify and satisfy self regarding all information contained herein. ALL BRICK HOME HAS THE POPULAR SPLIT BEDROOM FLOOR PLAN, MASTER SUITE WITH DOUBLE VANITY SINK, GARDEN TUB, SEPERATE SHOWER/TOILET AREA AND WALK-IN CLOSET. HOME IS ALL ELECTRIC, LAUNDRY ROOM LOCATED INSIDE, FORMAL DINING ROOM, WOODEN BLINDS AND A 2 CAR GARAGE WITH OPENER PLUS WOODEN DECK FOR RELAXING/ENTERTAINING. KITCHEN HAS BAY WINDOW TO CATCH THE VIEW AND LOTS OF CABINET SPACE. BUS ROUTE EXTREMELY CLOSE FOR SCHOOL AGED CHILDREN. OWNER WILL PAINT PINK BEDROOM AND YELLOW BATHROOM IF PREFFERED A NEUTRAL COLOR, HOME IS LOCATED ON A CUL-DE-SAC. PROPERTY TO BE SOLD “AS IS”. Dir: From Crestview, South on Hwy 85 to PJ Adams Parkway, take a right on PJ Adams, turn left on Lustan, just after Wildhorse Drive. Continue on Lustan to home on left. From Niceville, FT Walton , take HWY 85 North to Crestview, take left at stop light on PJ Adams Parkway and Hwy 85, follow to Lustan Dr, just after Wildhorse Dr(sop light at Northview and Wildhorse. Take a left on Lustan Dr, and follow to home on left. This is an inviting home in excellent condition. It is a split bedroom plan, the fully equipped kitchen has a pantry,and Dining room overlooks open deck. There is an inside laundry room, a spacious Master Bedroom with a large Walk-in Closet, warm and attractive decor and laminate flooring throughout the home, except for the master bath which has tile. Great for the alergy sufferers. There is a two car garage and a fenced back yard which has a beautiful, wooded view, no backyard neighbors and plenty of privacy. This is a short sale and will be sold in as is condition. Check this one out. Excellent location with easy access to Hwy 85 and points south or north. Dir: Hwy 85N, left on Jones Road, Home is 2nd on the right. Legal: OAKDALE MIN/FARMS LOT 5 BLK 7, LESS S 1/2 OF a 20 FT ADJACENT ALLEY on North side of lot. JUST REDUCED! Great possibility to change zoning to commercial! Adjoining properties are commercial. Ideal for office, beauty shop, child care, etc. Only a short distance to schools, post office, banks & shopping center. This home is all brick with vinyl soffits. Attractive upgrades have made this a very comfortable home. New AC compressor 2007, updated door knobs & light fixture with nickel finish. Updated interior includes champagne color walls, white trim and almond berber carpet, window treatments with vertical blinds included. Dir: Hwy 85 to PJ Adams. Follow about 3 miles to Antioch Elementary School. Follow behind school. First Right on Whitehurst and then another left on Whitehurst. Home will be on your right. Not a short sale. Very clean home south of I-10. Convenient to elementary school. Owners have installed new carpet, brand new 13 seer A/C unit, beautiful tile in wet areas and all new door hardware, cabinet hardware and light fixtures. Newly painted and move in ready. Kitchen is bright and sunny with a pantry, breakfast bar and kitchen nook with enough space for full size table. Large living room with plant shelves. Master bath has garden tub, double vanities, separate shower and his and her closets. Backyard is completely fenced with side gate. Golf Course Lot, located on the 10th Fairway of Foxwood Country Club. New Roof, dishwasher, and refrigerator installed in 2005. New Cermic Tile in the Kitchen and dining room. This home has a dream area downstairs for your pool table with light already in. It has a separate heating and air conditioning system. There is a large den and separate office downstairs besides the extra large pool room or game room. This home is perfect for entertaining. There is a screened sun room downstairs that leads out to the yard. Sit on the porch and watch the golf game. The downstairs could be fixed into a Mother-in-law suite or teenager suite. Do not miss looking at this home. This home is south of I-10 and lot is 1/3 of an acre. Awesome location. the house has 3 bedrooms and 2 baths upstairs but the downstairs room was also used as a bedroom suite (it has no closet), game room and office. There are 3 rooms downstairs. Dir: From I-10 take the Crestview exit South on Hwy 85. Turn right on PJ Adams. Follow PJ Adams for approx. 4 miles (crosses back over I-10). Entrance to Fox Valley subdivision on left (Fox Chase). Stay right on Fox Chase to Territory Lane to 645. SHORT SALE WITH APPROVAL SHOULD BE ABLE TO DO A QUICK CLOSE!! ** Newer home south of I-10. This is a beautiful all brick four bedroom three bath home located in fox valley. Split open floor plan with extras like plant ledges, gas fireplace,double glass french doors which open into the Florida room. Thomas Home plan 2800 B. Standard features included trey ceiling in MB, fully-sodded lot, sprinkler system, walk-in closets, wide colonial baseboards, NAFCO tile foyer, 5/8 sheetrock in all ceilings, rounded corners in common areas, large plant ledges, pre-wired for security and surround-sound, On Q Home Wiring System, telephone jacks w/CAT 5 Wiring in all bedrooms and kitchen, cable jacks in all bedrooms, double vanities in MB, 30-yr. Dimensional Shingles, steel garage door with decorative glass, brick mailbox, insulated steel exterior doors, Over a 100 acres will be left in its natural state. Wood buffers seperate the back yards from one another no septics homes have city sewer. This is a wonderful place to call home. The location is an excellent location for military personnel. Sold as is. SHORT SALE PRE APPROVED DEAL!!! Dir: West on PJ Adams. Left on Wildhorse. Immediate right on Riverchase Blvd. Left at stop sign. Right on Tom Sawyer. Home on the left. Not a short sale. Unbelievably clean, all brick home with a great floor plan and a large level backyard. As you walk into this lovely home, you have a formal dining room with chair rail on the left and an office/4th bedroom with French doors to the right. The expansive living room/family room has plenty of wall space for your furniture and a lovely gas fireplace and mantel for the cool Florida evenings. The bright kitchen has plenty of counter space plus an island for meal preparations. 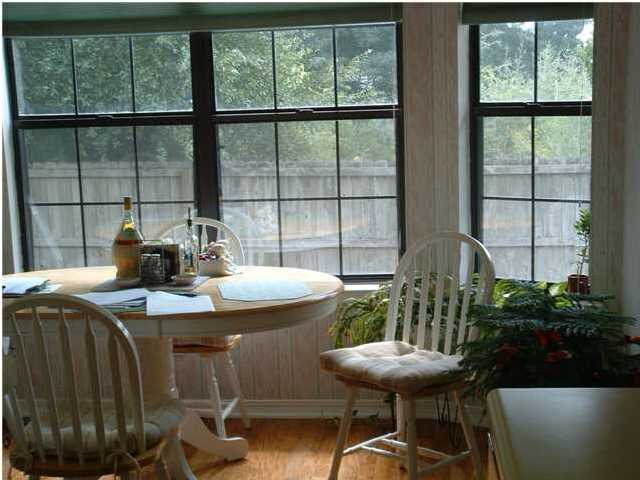 Sitting in the breakfast area, you can enjoy looking out into the backyard through the oversized windows. King size bed, dresser and a chest of drawers will easily fit in the master bedroom. The master bath has a separate shower, double sink vanity and a walk in closet. The split floor plan allows much privacy for the additional bedrooms and bathroom. The additional bedrooms are both large and have ample closet space. Off of the living room you will enjoy the screened in porch with fan. The fenced in back yard has a professionally maintained above ground pool and plenty of decking for several tables and chairs. The additional pool fence will keep the children away from the pool while you’re not there. Plenty of additional space in the backyard for other activities. South of I-10 which makes it an easy commute to Eglin and Duke Field. 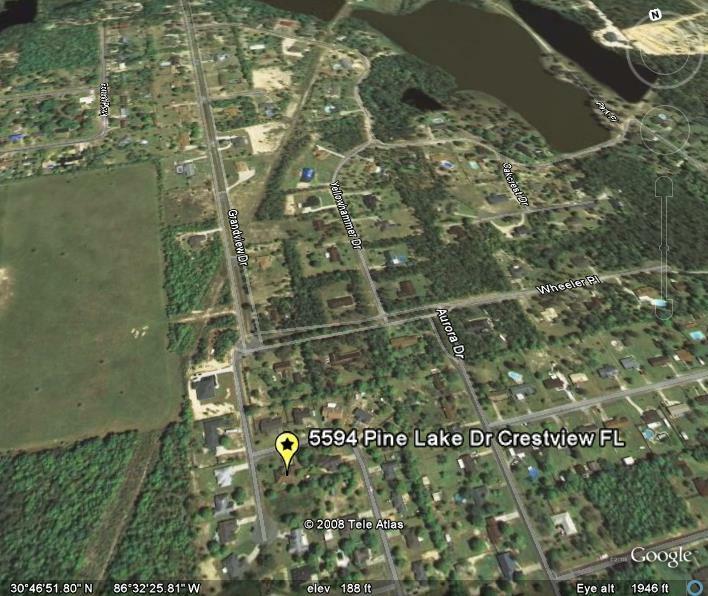 Dir: From Crestview Take Hwy 85 North past Crestview High School and Winn Dixie Shopping center to Old Bethel Rd, take a left on Old Bethel, follow 1.9 miles to Ridgelake Rd,take a left on Ridgelake, then a right on Woodbine, Left on Tranquility follow to last road, go right to end of cul de sac, home is left on cul de sac. or you can take Hwy 90 west to Old Bethel Rd, rt on Old Bethel Rd, then rt on Ridgelake rd, then same as the above directions. Come out to see this gorgeous home. A great buy in an upscale Neighborhood. This all brick home and very open design, features a huge Great Room, Formal Dining, plus an eat in kitchen with breakfast bar, granite countertops, all stainless steel kitchen appliances including a smooth top stove, built in microwave and a refrigerator and it has gorgeous cabinets. The fourth bedroom is being used as an office, it does have a walk in closet and laminate flooring, in fact there is no carpet in this home, just ceramic tile in both baths, foyer, & laundry room and laminate flooring throughout rest of home. Master bedroom has trayed ceiling and a huge walk in closet, the master bath has a double vanity, step in oversized shower and a jetted corner tub with tile surrounds. There are a lot of windows which makes this home light and bright. The openess of this home makes it a great home for entertaining so that no one is left out, the cook is included in all the activities because of the design. There is a screened porch at the rear of home which overlooks a fairly large yard, which has plenty of room to add a pool or play pitch with little ones or pets and yard is privacy fenced. You can’t beat the area and the home is truly beautiful, take a look at this home and decide for yourself. Did I mention there is a rose garden in the landscaping in front? Dir: HWY 85 North to HWY 90 West. Turn right onto Old Bethel at Tom Thumb. Enter Old Bethel Estates and take first left onto Warrior and at end of Warrior take left onto Trinidad. Home is on the right. Welcome to 302 Trinidad Court. This 2 story home is a must see. Get ready to enjoy your L shaped in ground pool with jacuzzi seat and slide and still a huge back yard for children to play. Owners have built a tri-level deck with step lights that would accommodate lots of out door furniture. Home has a huge fully fenced in yard. Wood flooring in foyer, kitchen and breakfast room. Home has separate dining room as well as a breakfast area in kitchen, separate laundry and 2 1/2 baths. Master bath has a garden tub, double vanities and separate shower. Walk in closet is in master bedroom. Home has security system, wood blinds, huge storage room in garage, large additional bedroom closets and 2nd full bath is larger than most. Owners to have newly painted so it will be move in ready. Buyers/buyers agent to verify schools, any measurements and other information deemed important. BIG Price Reduction on thisCharming Home in wonderful neighborhood on an Acre lot with a variety of trees and floral shrubbery. You will love the big front porch, large enough for your pretty porch furniture and a swing. There is a foyer entrance, Cathedral, beamed ceiling in Great Room with a Stone faced fireplace w insert. The kitchen has updated flooring (tile), smooth top stove, dishwasher, and built in Microwave. There is a study just off the master bedroom, this is a split bedroom plan. Laundry room has extra storage and shelving. Florida room features shelving and corner, curio cabinets and built in window benches for added storage that will convey.Florida room overlooks big back yard.Master bedroom has large walk-in closet and double vanity in Master bath.Air condition handler was replaced in 2006. New roof in 1999. New dishwasher 2008.There is a front and back sprinkler system and last but by no means least there is an L-shaped Workshop,workshop window air conditioner to be conveyed in “as is” condition. Workshop has electricty and concrete flooring also attached to the workshop is a 18 x19’11 Carport and a 12×12 storage building.Hurricane shutters have been cut and they will convey.This home offers so much, 3 Bedrooms plus an office, 2 car garage and a workshop guys will love. Call today to see this one. Dir: From Hwy 85 & 90 intersection, go north 5 miles on Hwy 85, property is on left, just past BJ’s Store. Home w/5 Acres, 4 Ln Hwy 85, commercial possibility, corner tract, 225′ frontage, 764′ on Sandy Lane, 3/2 BV, 1323 SF, home or office, zoned RGD with furture land use RR and RMU. Suggested uses: mini storage, church, beauty shop, food store, office, etc. Note: 12X20 metal storage bldg. does not convey. Dir: Highway 85N to left on Old Bethel Road. Left on Seminole and left again on Creek Drive. Home on right. Lovely custom built brick and stucco lake front home on 2.3 acres with small barn fenced and cross fenced. Enjoy your morning coffee on 35′ covered deck overlooking private back yard. Exterior features include stucco pillars around the front windows and front porch. Entering the home is a large foyer opening to the family room with columns and double trayed ceiling with rope lighting. Off the family room are french doors opening to the study that could be used as a fourth bedroom. The two additional bedrooms feature a jack and jill bath and both have walk-in closets. Large master bedroom with huge walk-in closet (21×14). Adjoining master bath features jetted tub, separate glass block shower and double vanities. Spacious kitchen overlooking den/breakfast nook with fireplace feature granite counter tops, breakfast bar, large hooded stove, custom wood cabinets, built-in microwave, and pantry. Travertine flooring throughout the den, kitchen, and foyer. Separate dining area with double trayed ceiling and wood floors. Just off the inside laundry room is a convenient 1/2 bath. For those of you looking for an oversized garage, how about 27×26 ft. This property has many upgraded features so please call today and make appointment to see this lovely home! SHORT SALE WITH APPROVAL SHOULD BE ABLE TO DO A QUICK CLOSE!! ** Newer home south of I-10. This is a beautiful all brick four bedroom three bath home located in fox valley. Split open floor plan with extras like plant ledges, gas fireplace,double glass french doors which open into the Florida room. Thomas Home plan 2800 B. Standard features included trey ceiling in MB, fully-sodded lot, sprinkler system, walk-in closets, wide colonial baseboards, NAFCO tile foyer, 5/8 sheetrock in all ceilings, rounded corners in common areas, large plant ledges, pre-wired for security and surround-sound, On Q Home Wiring System, telephone jacks w/CAT 5 Wiring in all bedrooms and kitchen, cable jacks in all bedrooms, double vanities in MB, 30-yr. Dimensional Shingles, steel garage door with decorative glass, brick mailbox, insulated steel exterior doors, Over a 100 acres will be left in its natural state. Wood buffers seperate the back yards from one another no septics homes have city sewer. This is a wonderful place to call home. The location is excellent military. SHORT SALE PRE APPROVED DEAL!! !